Okay. That front panel is really pushing my buttons. In the best possible way. Pure class. 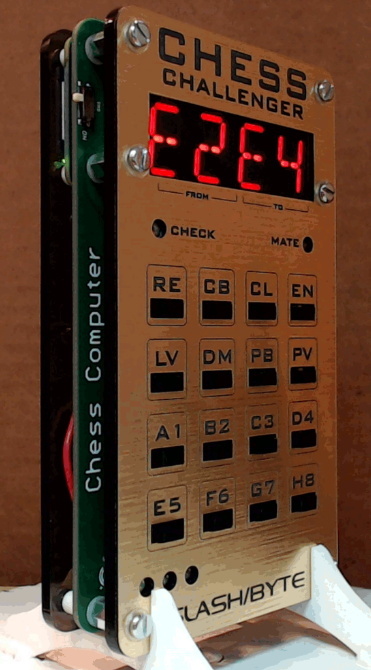 I’m still mad that they discarded a hundreds year old chess notation system, that I grew up with, to make things easier to program. Having learn a new notation is part of the “challenge”? Just a little clarification: Standard (“P-K4”) notation was discarded because it was occasionally ambiguous. Imagine a situation where either knight could capture the same piece. Or perhaps two pawns could capture the same opposing piece. Algebraic notation (“E4”) is clearly less ambiguous. As far as I am aware, the prevalence of algebraic notation has nothing to do with programming. In ’77 I was playing chess against an IBM 370 running code in APL and used “standard” notation. As I recall, the code used notation only in communicating with the human (l)user, not internally for any algorithm. P.S. : I thought RPN rocked… But now my HP calculator has an “=” key!! ???? I should add: there’s room for ambiguity in any notation, but there tends to be less with algebraic. Are these “starburst” LED displays different than “Union Jack”? Just depends on which made up name you were taught, I suppose. I wish I had the patience/time to fork this project and add an OLED display on it. Come on, guys, it’s 2019! Let’s take advantage of the newer/better/prettier components we have available now. This comment is really impressive to me as it not only shows you completely ignored the theme of the device (to replicate a piece of 70’s tech), but at the same time admit you’re too lazy to make these supposed necessary “improvements”. Even for a HaD comment, this is an incredibly inane statement. It’s truly an accomplishment in its own way. And you must be fun at parties.